More cross-ice games and practices, and a greater emphasis on skill development and fun are the backbone of the American Development Model. What a great ride it’s been in just a few short months as I’ve been everywhere from Dallas to San Jose, Calif., and many places in between to discuss all that’s right about the American Development Model. Our emphasis with the ADM to this point has been on the 6- to 12-year-old hockey players, and even more specifically with the 8 & Under age group. ADM regional managers have been meeting with parents, coaches and administrators to discuss the science that is such a key component of ADM. The science that tells us there are five physical capacities (speed, skill, suppleness, strength and stamina) that can be readily developed and the accompanying ‘Windows of Trainability’ when our bodies are most receptive to developing these capacities. If we don’t target our training to take advantage of these windows, we have missed key opportunities in developing our young athletes for hockey and other sports. We’ve also been discussing a hockey culture that has evolved into encouraging too many games in relation to practice opportunities; pushing early specialization in one sport; an over-emphasis on ‘travel hockey’ at a young age; and too much importance placed on the scoreboard and teams’ won-loss records. Not only do these trends actually hinder long-term athlete development, but they are in no small part responsible for driving families out of the game due to increased cost and time commitment associated with an excessive amount of games and travel. So what can coaches, parents and players do in the near term to start advancing and implementing portions of the ADM? I would encourage coaches, if they haven’t already done so, to run a five- or six-station practice with 60 or more Mites and Squirts and “embrace the chaos” that comes with so many kids skating, shooting and handling pucks at one time. If they cross over into another station and bump into each other, all the better, as the kids have just learned the concept of “awareness” and “heads up hockey” without even knowing it. Our experience has been that kids absolutely love these high energy, constant activity practices. Third, encourage young kids to play at least two other sports or athletic activities in addition to hockey, and set up a structure and season length that allows them to do so. They will benefit in many ways both on and off the ice from multi-sport participation. Successes I’ve witnessed include associations increasing player ice touches at no extra cost through shared practices, creative off-ice activities that target kids’ agility, balance and coordination, and associations using their most talented coaches to affect a broader range of players, especially at younger ages where learning the fundamental skills is so important. 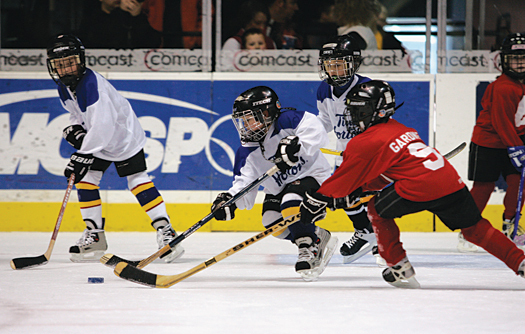 In that light, instead of the traditional shared practices, where teams split up at each end of the ice or into three separate zones and do their own thing, many associations are running practices where the coaches work with all the players in a particular age group, not just their team, as the players move through various stations on the ice. The benefit to the players is the chance to learn from a more diverse group of coaches, and coaches can learn new concepts, ideas and drills. Ultimately, taking advantage of nearly every minute of an ice session by keeping the kids feet moving, including a significant amount of ‘free play’ in every practice, and making the experience fun will lead to more kids staying with the game for a longer period and better player development. Joe Doyle is the regional manager for the American Development Model for the Rocky Mountain and Pacific Districts.